Weingut Robert Weil is without any doubt the Rheingau’s flagship winery. It is currently managed and co-owned by Wilhelm Weil. I met Wilhelm for the first time at the 1. International Riesling Symposium last year at Schloss Rheinhartshausen und we have been in touch since then. For more on the Riesling Symposium see here. I was delighted when he invited me over to his Weingut in Kiedrich, when I was in Germany during the summer. Wilhelm showed us the vineyards and the winery, followed by a tasting of the 2010. This posting focuses on the first part. A second posting on the tasting of the 2010 Weil wines will follow. It is remarkable: For its entire length of nearly 560 miles, the Rhine flows north with one exception – a 28-mile stretch where the river changes its course. Here, it flows to the west, thereby enabling both the river and the vineyards facing it to bask in the warmth of the sun all day long. This is the Rheingau, one of the medium-size German wine regions. It is a quietly beautiful region, rich in tradition. Queen Victoria's enthusiasm for Hochheim's wines contributed to their popularity in England, where they, and ultimately, Rhine wines in general, were referred to as Hock. The third President of the USA - and notable bon viveur - Thomas Jefferson visited the Rheingau in 1788 and wrote that the wine of the "Abbaye of Johnsberg is the best made on the Rhine without comparison … That of the year 1775 is the best." He also referred to the Rheingau’s Riesling as the "small and delicate Rhysslin which grows only from Hochheim to Rudesheim". Impressed by the quality of the Rheingau Riesling wines, he bought 100 grapevines to take back to his estate in Virginia. Although the Rheingau is one of Germany’s smaller wine-growing regions, its 3,100 ha (7,660 acres) of vineyards are vastly diverse in their geological makeup. They can be divided into four zones: vineyards in the Rhine, vineyards in proximity to the Rhine, vineyards on the higher reaches of the middle plateau, and vineyards on the heights at the foothills of the Taunus Hills. The Rheingau is dominated by Riesling, accounting for 4/5 of the vineyard area. Pinot Noir accounts for 1/10 and is concentrated around Assmannshausen. Weingut Robert Weil is located in the heart of Kiedrich, a village first documented in 950. Its profile is marked by the artworks and architecture of the Gothic parish church St. Valentine, aristocratic Gothic, Renaissance manors, and the tower of Scharfenstein castle, a former residence of the electors and archbishops of Mainz. Some of the roots also extend to the well-known Prüm dynasty in Bernkastel on the Mosel. Founded in 1875, Weingut Robert Weil in Kiedrich is the Rheingau’s #1 estate and one of Germany’s best. Four generations and over a century ago Dr. Robert Weil, who was a Professor of German at the Sorbonne, was forced to leave Paris because of the Franco-Prussian War (1870/1871). He subsequently joined his brother August in Kiedrich in the Rheingau and established the Robert Weil winery. Dr. Robert Weil purchased his first vineyards in Kiedrich and moved there in 1875, when he bought the estate manor from the heirs of Sir John Sutton, an English baronet. A man of vision, he built up the estate by purchasing 2 local wine estates and the vineyards of Count von Fürstenberg. Contacts throughout the world and the production of great wines brought rapid growth to the Weingut Robert Weil. Today, Weingut Robert Weil is managed by Wilhelm Weil, who owns the winery jointly with Suntory from Japan. 75 hectares under vine, it is one of the largest estates in the Rheingau. The historical manor house, the ultra-modern cellars and the vinothek stand side by side in a beautiful park – the same synthesis of old and new that is reflected in the estate’s philosophy of winemaking. While I visited Weingut Weil in the summer of 2011, major extension works were going on. In 1988, the estate was sold by Robert Weil to the Japanese beverage group Suntory, and his son Wilhelm appointed as estate director. The vineyard area was doubled, and an ultra-modern cellar built. I did not ask Wilhelm, but he is reportedly in the process of repurchasing shares from Suntory. While we visited Weingut Robert Weil, there was construction work going. “We want to double the surface of the winery’s underground cellar” Wilhelm said. The vineyards are planted 99% with Riesling and 1% with Spätburgunder, but Wilhelm told me that the production of Spaetburgunder at Weingut Weil will cease. The estate’s dedication to Riesling since 1875 has led numerous observers of the international wine world to regard Weingut Robert Weil as a worldwide symbol of German Riesling culture. A Riesling wine of the 1893 vintage, grown on the Gräfenberg site, made the estate famous. The imperial Habsburg court in Vienna purchased 800 bottles of this wine at a price of 16 gold Marks per bottle in 1900. The 1920 vintage of the Kiedricher Gräfenberg Trockenbeerenauslese is described as a Zeppelin wine, as it was served on board the LZ 127 „Graf Zeppelin” dirigible on its circumnavigation of the world in 1929. Robert Weil’s top botrytis wines are sold today at extremely high prices - they are among the most expensive in the world. The current world record (in 2006) is held by a 1999 Weil Trockenbeerenauslese, at DM 5.000 (EUR 2500). 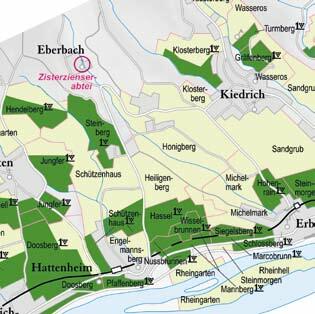 Weingut Robert Weil’s top vineyards all belong to the group of the highlying sites of the Rheingau: Kiedricher Klosterberg, Kiedricher Turmberg and Kiedricher Gräfenberg. Inclination (up to 60 %), exposure (southwest) and the ability of the barren stony soils to absorb heat are the factors that make for three perfect Riesling sites. These conditions, as well as ideal circulation, enable the grapes to remain on the vine for a long time, ripening well into November. Kiedrich Gräfenberg: Kiedrich Graefenberg is situated on a southwest-facing ridge and a steep cliff with inclines of up to 60 percent. The soil consist of deep and medium-deep stony, fragmented phyllite partially mixed with loess and loam. This combination of barren stony soils, an ideal microclimate, steep inclination and southwestern exposure allows the grapes to hang on the vine for a very long time. At the end of the 12th century, the renowned site was first documented as “mons rhingravii” (literally, the hill of the Rhine counts) and in 1258, was named “Grevenberg.” To this day, Gräfenberg has remained a focal point. The record prices it fetches at auctions bear witness to the site’s renown. Gräfenberg is the only site in the world in which grapes of every quality category – including Eiswein and Trockenbeerenauslese – have been harvested every year without exception since the 1989 vintage. Kiedrich Klosterberg: The name Klosterberg (literally, monastery hill) derives from “Closterweg,” the old path that ran through this vineyard in Kiedrich en route between the monastery Kloster Eberbach and its mill near Eltville. The shallow to deep stony-gritty soils of the southwestfacing site are of Devonian (colored slate) and pre- Devonian (phyllite and sericite gneiss) origin, and are mixed with gravelly loess. Kiedrich Turmberg: Since the founding of Weingut Robert Weil, the Turmberg site was always considered one of the estate’s top sites, second only to Gräfenberg. The name Turmberg (literally, tower hill) derives from the surviving keep (central tower) of the former castle Burg Scharfenstein. The archbishops of Mainz had the fortress built on the steep crag northeast of Kiedrich in 1160. With it, the Rheingau sovereigns hoped to secure the eastern flank of the Rheingau as well as the important trade route that ran from Eltville to Limburg and Cologne. Turmberg lies on the slopes of a steep, slaty crag. Its stony-gritty soils consist primarily of phyllite mixed with small portions of loess and loam. With the wine law of 1971 and its amendment of the vineyard register, numerous traditional vineyards, like Turmberg, were incorporated into other sides. In 2005, the Turmberg parcel was reinstated as an individual vineyard site consisting of 3.8 ha (9.4 acres). It is solely owned by Weingut Robert Weil. Grosse Lage and Erste Lage - A New Approach? When botrytised grapes are being picked, these are selected in the vineyard and immediately sorted into three different containers, depending on the degree of botrytis. The grapes are again selected berry for berry in the cellar. Vinification takes place in stainless steel tanks of varying sizes (depending on the size of an individual lot) and in traditional mature oak casks (“Rheingauer Stückfass”: 1,200 liters). Yeast contact and stirring (bâtonnage) is also used. After a slow fermentation and aging, the wines are sterile filtered and bottled as gentle as possible in order to retain the wonderful primary grape aromas and for additional aging in the bottle. A second posting on the tasting of the 2010 Weil wines will follow. meinen herzlichen Dank für die tolle Präsentation unseres Hauses! Why are you always so much on the pictures? Why do you need to be so much in focus instead of the persons you are interviewing and their wines? I dont get it.